'Diversity of tactics' becomes an easy way to avoid wrestling with questions of strategy and accountability. It lets us off the hook from doing the hard work of debating our positions and coming to agreements about how we want to act together. It becomes a code for 'anything goes,' and makes it impossible for our movements to hold anyone accountable for their actions. 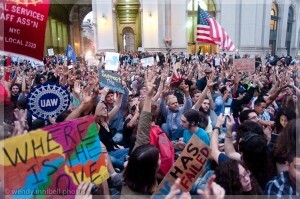 The Occupy movement includes people from a broad diversity of backgrounds, life experiences and political philosophies. Some of us want to reform the system and some of us want to tear it down and replace it with something better. Our one great point of agreement is our call for transparency and accountability. We stand against the corrupt institutions that broker power behind closed doors. We call to account the financial manipulators that have bilked billions out of the poor and the middle classes. Just as we call for accountability and transparency, we ourselves must be accountable and transparent. Some tactics are incompatible with those goals, even if in other situations they might be useful, honorable or appropriate. We can't be transparent behind masks. We can't be accountable for actions we run away from. We can't maintain the security culture necessary for planning and carrying out attacks on property and also maintain the openness that can continue to invite in a true diversity of new people. We can't make alliances with groups from impacted communities, such as immigrants, if we can't make agreements about what tactics we will employ in any given action. The framework that might best serve the Occupy movement is one of strategic nonviolent direct action. Within that framework, Occupy groups would make clear agreements about which tactics to use for a given action. This frame is strategic - it makes no moral judgments about whether or not violence is ever appropriate, it does not demand we commit ourselves to a lifetime of Gandhian pacifism, but it says, 'This is how we agree to act together at this time.' It is active, not passive. It seeks to create a dilemma for the opposition, and to dramatize the difference between our values and theirs. Strategic nonviolent direct action has powerful advantages: We make agreements about what types of action we will take, and hold one another accountable for keeping them. Making agreements is empowering. If I know what to expect in an action, I can make a choice about whether or not to participate. While we can never know nor control how the police will react, we can make choices about what types of action we stand behind personally and are willing to answer for. We don't place unwilling people in the position of being held responsible for acts they did not commit and do not support. In the process of coming to agreements, we listen to each other's differing viewpoints. We don't avoid disagreements within our group, but learn to debate freely, passionately, and respectfully. We organize openly, without fear, because we stand behind our actions. We may break laws in service to the higher laws of conscience. We don't seek punishment nor admit the right of the system to punish us, but we face the potential consequences for our actions with courage and pride. Because we organize openly, we can invite new people into our movement and it can continue to grow. As soon as we institute a security culture in the midst of a mass movement, the movement begins to close in upon itself and to shrink.Holding to a framework of nonviolent direct action does not make us 'safe.' We can't control what the police do and they need no direct provocation to attack us. But it does let us make clear decisions about what kinds of actions we put ourselves at risk for. Nonviolent direct action creates dilemmas for the opposition, and clearly dramatizes the difference between the corrupt values of the system and the values we stand for. Their institutions enshrine greed while we give away food, offer shelter, treat each person with generosity. They silence dissent while we value every voice. They employ violence to maintain their system while we counter it with the sheer courage of our presence. Lack of agreements privileges the young over the old, the loud voices over the soft, the fast over the slow, the able-bodied over those with disabilities, the citizen over the immigrant, white folks over people of color, those who can do damage and flee the scene over those who are left to face the consequences.Lack of agreements and lack of accountability leaves us wide open to provocateurs and agents. Not everyone who wears a mask or breaks a window is a provocateur. Many people clearly believe that property damage is a strong way to challenge the system. And masks have an honorable history from the anti-fascist movement in Germany and the Zapatista movement in Mexico, who said "We wear our masks to be seen." But a mask and a lack of clear expectations create a perfect opening for those who do not have the best interests of the movement at heart, for agents and provocateurs who can never be held to account. As well, the fear of provocateurs itself sows suspicion and undercuts our ability to openly organize and grow. A framework of strategic nonviolent direct action makes it easy to reject provocation. We know what we've agreed to - and anyone urging other courses of action can be reminded of those agreements or rejected. We hold one another accountable not by force or control, ours or the systems, but by the power of our united opinion and our willingness to stand behind, speak for, and act to defend our agreements. A framework of strategic nonviolent direct action agreements allows us to continue to invite in new people, and to let them make clear choices about what kinds of tactics and actions they are asked to support. There's plenty of room in this struggle for a diversity of movements and a diversity of organizing and actions. Some may choose strict Gandhian nonviolence, others may choose fight-back resistance. But for the Occupy movement, strategic nonviolent direct action is a framework that will allow us to grow in diversity and power. To read more pieces like this, sign up for Tikkun Daily’s free newsletter, sign up for Tikkun Magazine emails or visit us online. You can also like Tikkunon Facebook and follow us on Twitter.